Please subscribe or follow Stampin Inspirations. I have come to the decision that I can no longer maintain 3 blog sites. I've thought about it for a while now and as much I've enjoyed creating a separate blog site for my Paper Crafting Creations and focusing only on "scrappy creations", trying to keep up with 3 sites have been quite difficult. My daughter will be heading out to college this year and in the following months, we will need to take a few trips to visit the various colleges to see which campus fits her needs, I realize that it would be a disservice to my readers if I cannot keep up regular postings for 3 blog sites because I'll be away for periods of time throughout the months. I will continue to create "scrappy creations", "scrapbooking and altered projects" on Stampin Inspirations but will no longer maintain this site. Not to worry. . .Card Inspired will continue to remain open to reference back to past tutorials and projects. I will link it on Stampin Inspirations!! Thank you for being such wonderful readers. I feel that by maintaining one blog site, I can concentrate on being more creative rather than rushing through each projects just so I have something to post. You have been fabulous and I really am appreciative of your support throughout the past 2 years!! Card Inspired was my very first blog and it is my "baby" so to speak but she has grown up and moved out to a new space. I would love to see you on Stampin Inspirations so be sure to follow me there!! Hi Everyone!! Gosh, I haven't made anything for this site for almost a week! Sorry about that. . .I've been busy working on a few things which have taken me away from my scrappy projects. Since I'm here. . .let's chit-chat! LOL! While I was altering this shortbread cookie tin, I was thinking about my blogging and crafting activities. Not many of my "real life" non-crafting friends and family in Hawaii are aware that I blog. It's almost like a secret activity that I do . . .
About six months after I started my blog, I had mentioned to a close friend that I crafted and blogged several times a week and sometimes daily since I became a SAHM and I've made a few "blogging" friends online. . .and she laughed and said "really?, how cute!" and I asked her what she meant by "cute" because it didn't really sound very "flattering"!! LOL! She said. . ."I never knew you to be the type. . .you know, the house wifey type that craft and blogged". I said "it's fun. . .you should at least try blogging " (she's not the crafty sort). She then said "oh, no. . .I don't have the time to do thaaaaaaaat" (she works full time and likes to do outdoor activities). It almost sounded as if she was saying that I had a lot of time on my hands and I'm like some sort of bored housewife or something!! LOL! Since then I decided that I won't really talk about it to others who don't craft or blog . .they probably wouldn't be able to relate or even understand the concept of blogging anyway. Anyway. . now to my altered tin container. This was previously a shortbread cookie tin. 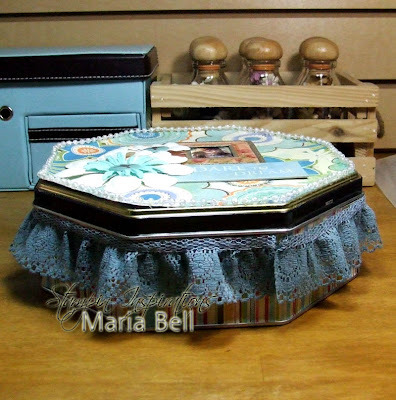 I adhered designer paper on to the tin and decorated it with an eyelet lace, beads, and scrapbook embellishments. 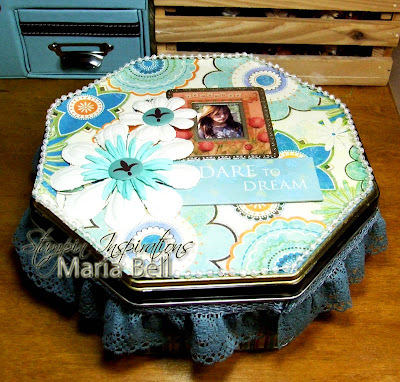 I think I'm going to give this tin box to my daughter. . .baby blue and brown is her favorite color. Initially I wasn't going to add the lace but I saw it in a container and I think I bought it like 3 or 4 years ago so I decided to use it. How sad that it has been sitting in container for that long! LOL! I added the photo of my daughter using the "K&CO" metal/decorative frame. Anyway. . hope y'all have a fabulous Thursday!! Hello, Friends!! I have a big announcement to make! I started a group blog called "Chistmas Stampin' All Year Long". Stop by and I would love, love, love to have you play along. This week's challenge is a sketch challenge and the card above is my sample. 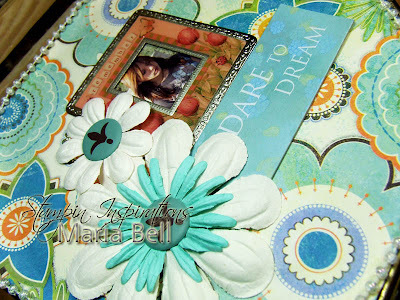 Check out the other blog member's samples. . .all their cards are "inspirational"!! Were you behind on you Christmas cards and handmade gifts last year? Did you feel overwhelmed during the holidays trying to catch up on creating your cards? Did you fail in sending your Christmas cards on time or not send any at all? Well, this challenge blog is the place for you to get motivated to start NOW!!! Each week, I'll post a challenge (sketch, color combo and others) each and the group members will show samples of their cards on the group blog. I will upload your card photo on to an album on Paper Craft Planet so everyone can see your lovely work. This blog site is primarily a motivational site but from time to time, I may do a contest . . .maybe once a month and I'll have the group members vote on which card they liked best. Anyway. . .stop by the group blog today and check out are first challenge and the samples!! I hope this challenge blog will help you to get motivated to create your Christmas cards. Christmas Stampin All Yearl Long has 9 blog members so far! Whoohoo. Hi Friends! I just wanted to let you know I posted a written tutorial on my Stampin Inspirations Club Site! It's a cute album especially for Valentines. Check it out! Hi Everyone!! 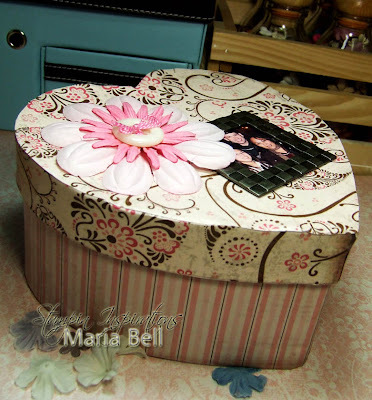 I created a video tutorial on how to line a round or heart box using designer paper. There's a way to apply designer paper to round boxes so that they appear smooth with a nice finish. I also created a written tutorial of this project. I had created the written tutorial over a year ago. There is a slight variation to the video tutorial vs written tutorial but the same concepts apply. I created this box for mementos and photos that I'll probably place on to my night stand. It makes for a nice bedroom decor while being functional at the same time. 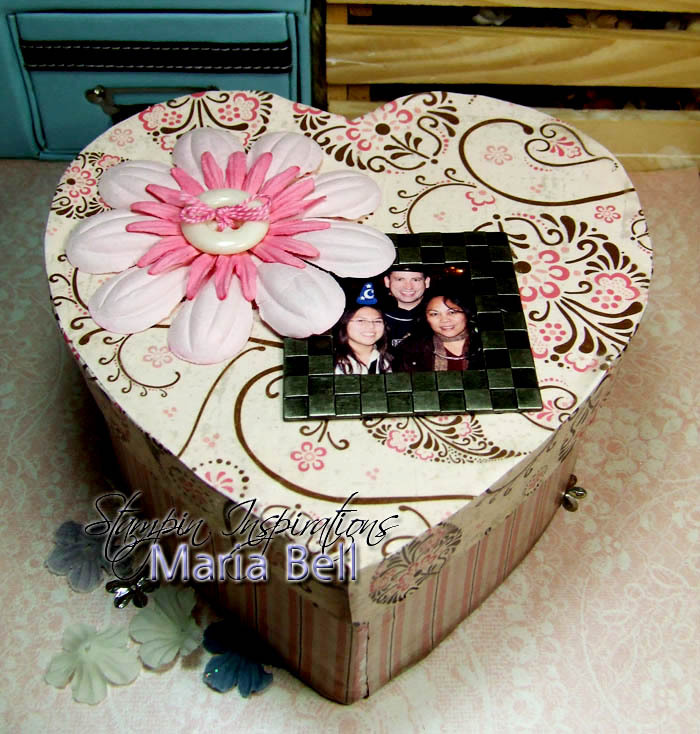 I covered my box using Close to My Heart designer paper "More to Adore". It's such a pretty paper especially for Valentines. 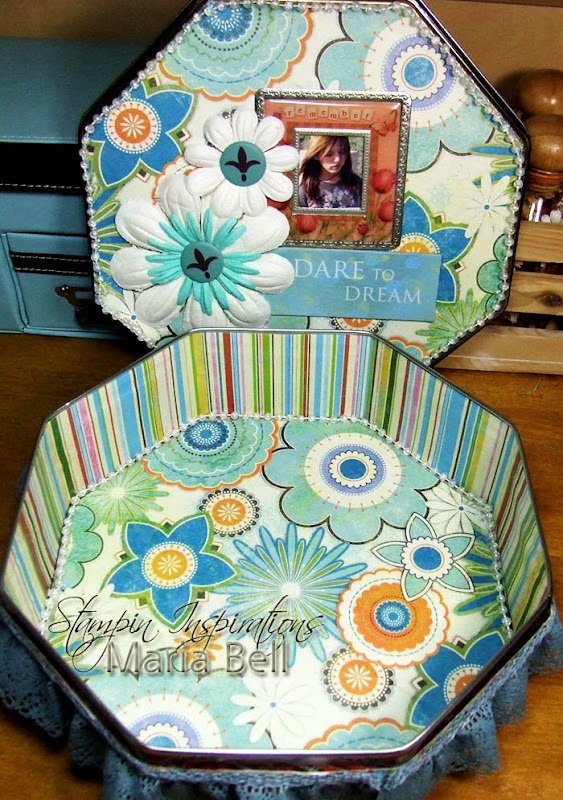 To decorate the top, I added large prima flower, button, and a metal frame by Making Memories with a photo. I don't have time to chit-chat but check out the video or written tutorial when you have the chance. It's pretty late right now and I'd like to go to bed. Hope you all have a fabulous day!! Hi Everyone! I just wanted to let you know who visit this blog site that I posted 3 tutorials both on my Stampin Inspirations blog site and Stampin Inspirations club site. Check them if you have the time!! They are easy projects and techniques. Hi Everyone! Hey check out my first scrapbook layout for the year!! Whoohoo!! Actually, it's my first scrapbook in months! 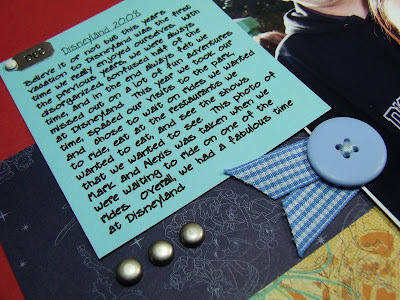 I don't know. . .I'm a bit intimidated by scrapbooking. I'm not very good at it and I've read magazines, blog sites, and even a few books by scrapbooking gurus and honestly, I still don't get it. LOL! I've decided to stop listening to my "pessimistic voice inside my head" and just throw stuff together and see what I come up with. 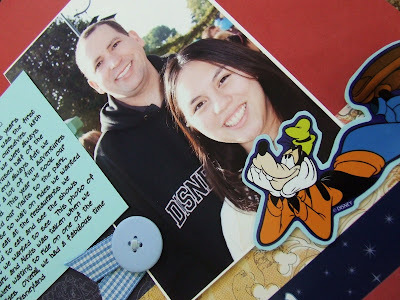 Anyway. . .I'll be creating layouts of our trip to Disneyland during the holidays. I bought a scrapbook album while we were at Disneyland and a scrapbook kit that came with a few Disney designer papers and stickers. The photo is of my daughter and DH waiting in line for a ride. We had a wonderful time at Disneyland. . .I think this trip was the best one of the last 3 trips to Disneyland. Don't be surprised if you see more Disney LOs in the next coming days and weeks!! Hi Everyone!! 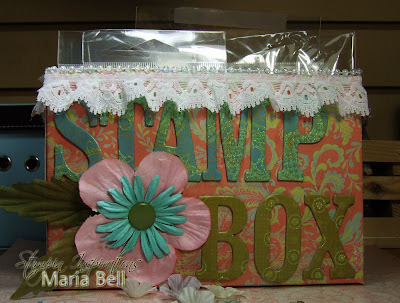 I just wanted to let you know that I posted a written and video tutorial on my Stampin Inspirations Blog Site. 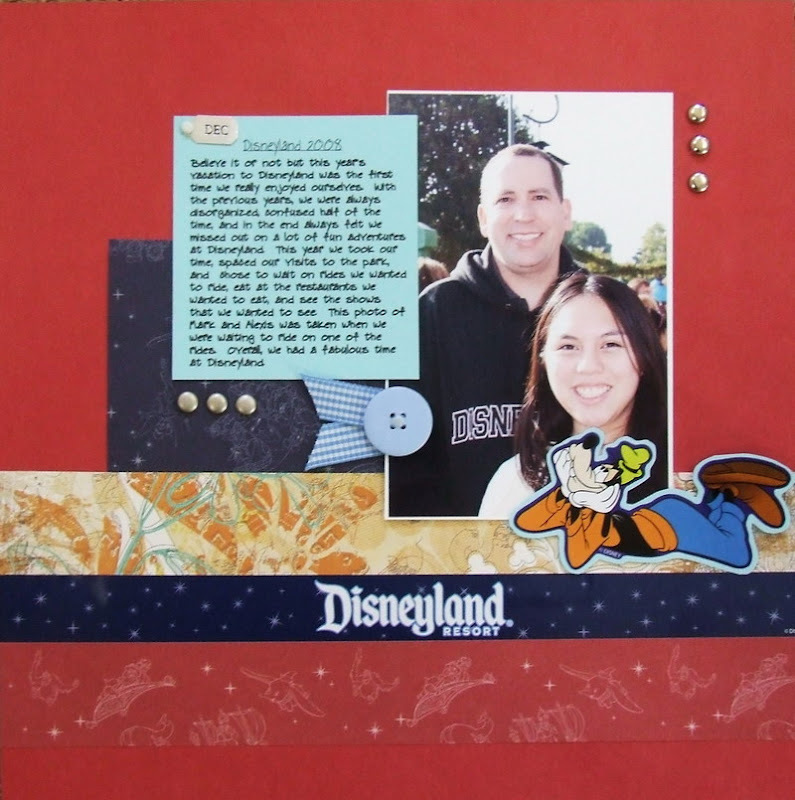 I used Stampin Up products so I posted it on that blog site. Go check it if you want to!! Hi Everyone!! 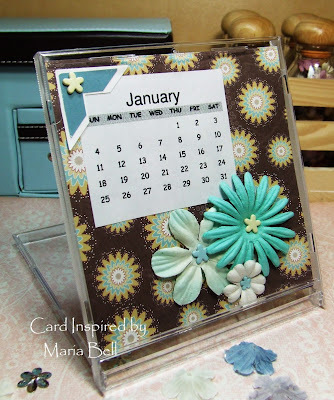 I created this CD case calendar today. It was super duper quick. I've been trying to find ways to use up my scrap designer papers and I thought this was a fabulous way to use up some of them. The tutorial below is a tutorial I created for my Stampin Inspirations Club Site using Stampin Up materials but I wanted to create a scrappy one too. This version is a little different from the one in the video tutorial. Rather than putting all 12 months together on one panel, I separated each month and created a different panel for each month. This is January's page. I primarily used Prima flowers to decorate it. I think I finished this page within 10 minutes. Gotta love it when it's quick. 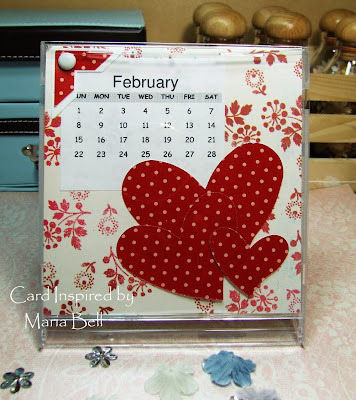 With February, all I did was run my Sizzix die and created the hearts, stuck it on to the designer paper and added the photo corner to top left. That's it. . .again less than 10 minutes. I'm working on March right now. I can't find my "spring" stack of designer papers so I didn't work on it. Anyway. . .try out the tutorial. Hope you all have a fabulous weekend!! Hi Everyone!! I'm back from a great trip to Disneyland and having my family from Hawaii visiting for the holidays! They were staying over at our house and they left today. We had so much fun celebrating the holidays at Disneyland. . .it was nice to have my family here with us because I haven't seen them for 3 years and having them over for the holidays was such a great ending of 2008 and the start of the New Year. Now, that they left. . .well, it's back to the business of creating and blogging! 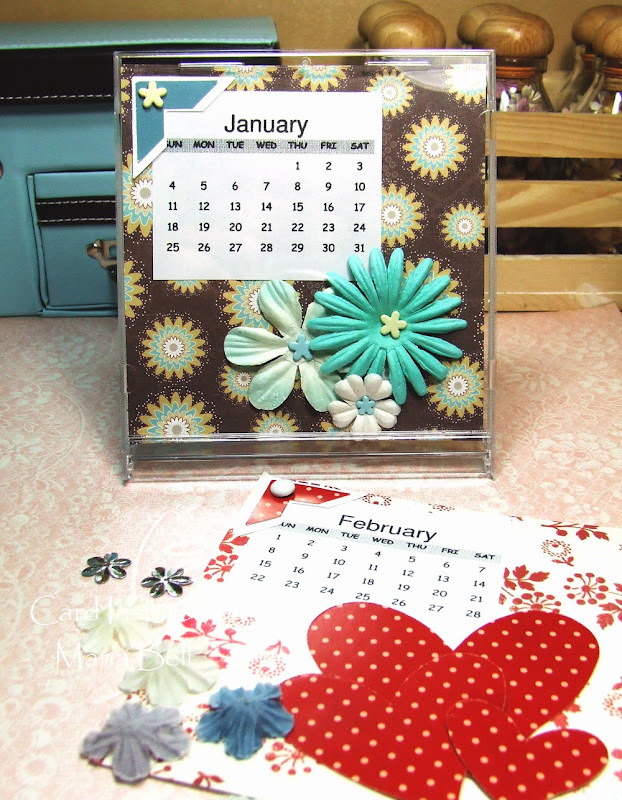 To start off the new year, I created this box to store my clear stamps using a Nestle Cocoa Box as my template. I created a short tutorial on how I made this box. It's really easy so check it out! You will end up with 2 or more pieces depending on the size of your box. Trace the box on to computer paper using a pencil and cut on the score line to create your template. 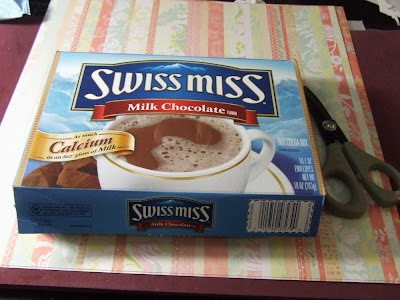 Again, if the box is big then you may end up with 2 or more pieces. If you don't care to trace the box to create a template, apply glue directly on to the box and adhere to a designer paper. Wait for the glue to dry and cut the designer paper along the edge of the box and re-assemble the box together using the creases as you guide. If you have two pieces or more, apply glue on to the designer paper where needed to adhere the box together into one piece. Decorate your box as desired. With this box, I had cut out the top flaps to provide an opening at the top. This allowed me to store my clear stamps at an upright position. Happy New Year, Everyone!! I hope you all had a great time celebrating the New Year!!! We had a blast at Disneyland and just got home today. My family from Hawaii are still here vacationing and are staying at our home so I haven't really had the time to respond to emails or post on my blog! They'll be here until Tuesday, January 6th and after that I'll be back in blogging business!! LOL! I'll see if I can post a few pictures from our time at Disneyland when I have the chance. Gosh, I have a list of New Year Resolutions to work on. . .unfortunately, I can't really work on them while my family is here. . . .for example. . . exercise or go on a diet and my various crafting goals! Anyway. . .I hope your year started off fabulously!!! I think 2009 will be a better year for me. 2008 wasn't a very good year for me. . .so I do look forward to sort of start off fresh and hopefully, the year will turn out to be a happier year!! I wish the same for all of you! !